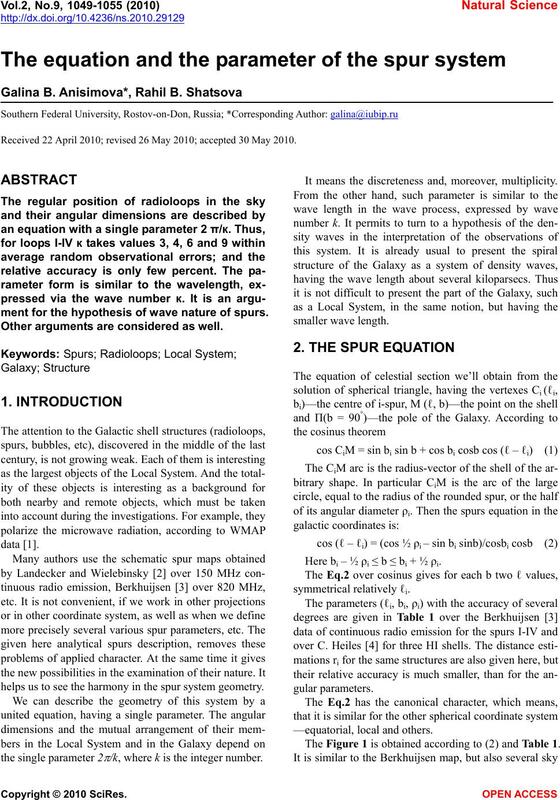 Received 22 April 2010; revised 26 May 2010; accepted 30 May 2010.
ment for the hypothesis of wave nature of spurs. Other arguments are considered as well. 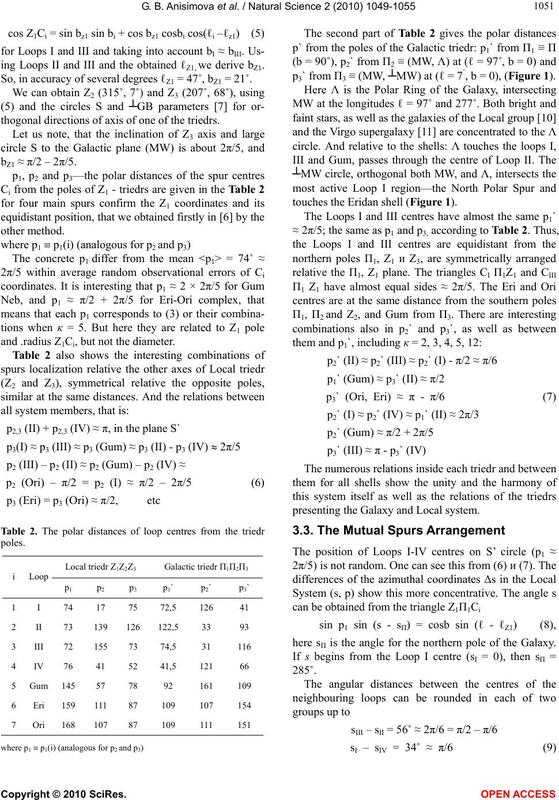 helps us to see the harmony in the spur system geometry. /k, where k is the integer number. It means the discreteness and, moreover, multiplicity. Here bi – ½ ρi ≤ b ≤ bi + ½ ρi. The Figure 1 is obtained according to (2) and Table 1. Table 1. The shell parameters over the radio data. and their poles Z1,Z2,Z3 and П1, П2, П3 are shown. orienteers, mentioned below, are added. 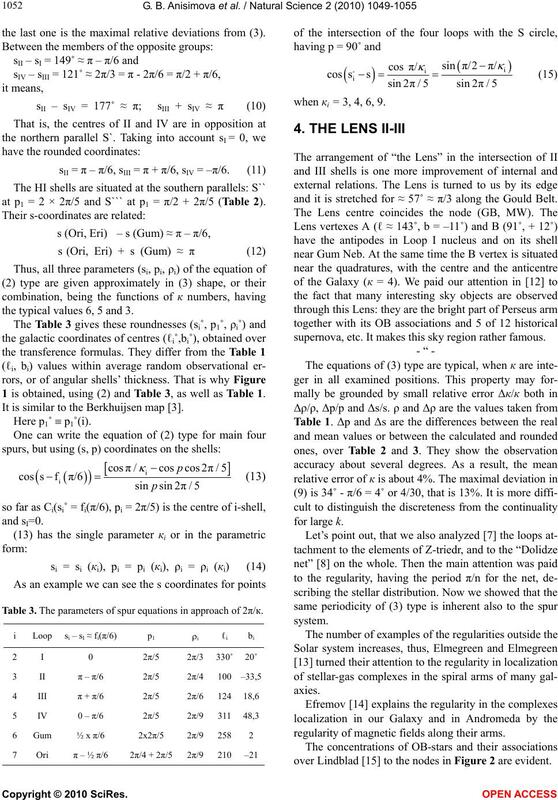 tions and showing the peculiarities of the Eq.2. the Sun is inside this bubble, its кi = 1.
to the equator S (Figure 1), having the common pole Z1. shell and recently discovered Loop VI . 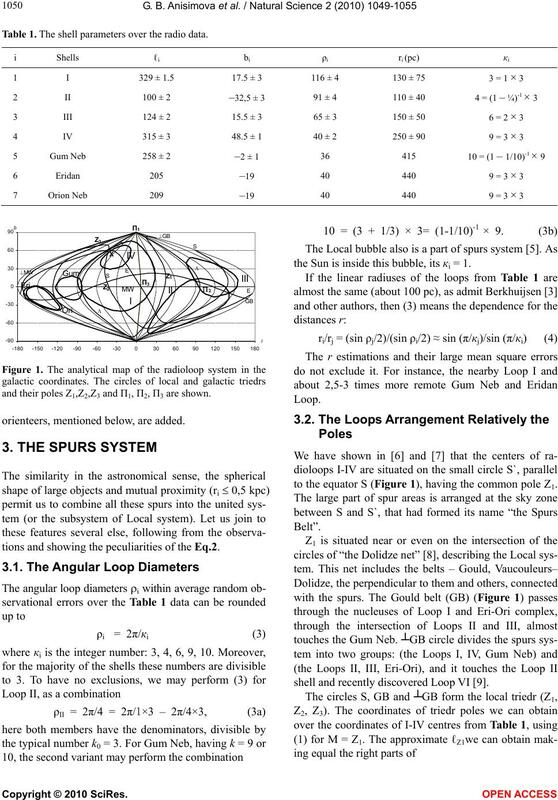 ing Loops II and III and the obtained ℓZ1, we derive bZ1. So, in accuracy of several degrees ℓZ1 = 47˚, bZ1 = 21˚. thogonal directions of axis of one of the triedrs. bZ1 ≈ π/2 – 2π/5. and .radius Z1Ci, but not the diameter. 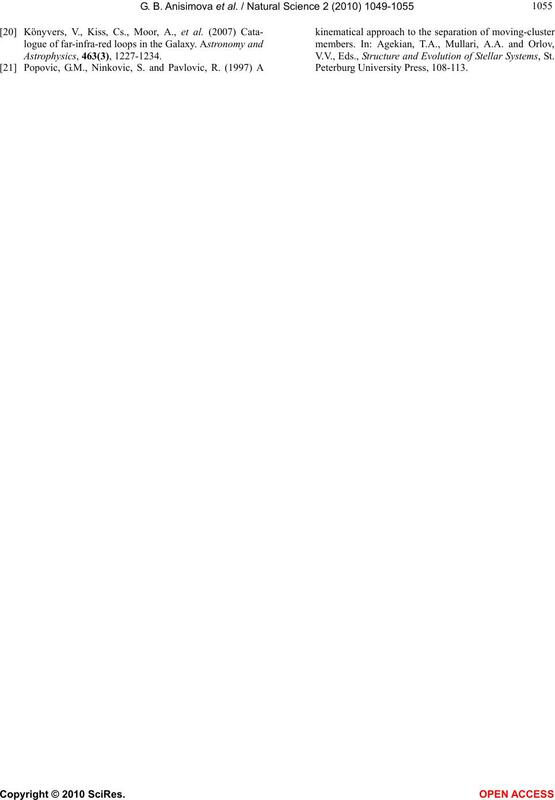 p3` from Π3 ≡ (MW, ┴MW) at (ℓ = 7˚, b = 0), (Figure 1). touches the Eridan shell (Figure 1). presenting the Galaxy and Local system. here sΠ is the angle for the northern pole of the Galaxy. the last one is the maximal relative deviations from (3). at p1 = 2 × 2π/5 and S``` at p1 = π/2 + 2π/5 (Table 2). the typical values 6, 5 and 3. 1 is obtained, using (2) and Table 3, as well as Table 1. It is similar to the Berkhuijsen map . Table 3. The parameters of spur equations in approach of 2π/к. when кi = 3, 4, 6, 9.
and it is stretched for ≈ 57˚ ≈ π/3 along the Gould Belt. supernova, etc. It makes this sky region rather famous. regularity of magnetic fields along their arms. over Lindblad  to the nodes in Figure 2 are evident. Z1 and Z2 and the ridges net of probable density waves. and spur distributions and perhaps the other objects. according to Lindblad version , Figure 2.
inclined to the Galactic plane (MW) for the angle ≈ 2π/5. form the united ridge SS’. Aquila Rift is in the opposite direction. from one side, and touching Loop I from another. axis Z1 and Z2; and the net ridges of probable density waves. And the kinematic aspect must be examined, as well. sky-Kapteyn figures show the same . tence of the wave process. vidual observed data and their accuracy are so important. permits to create new perspective hypotheses. (instead of, for example, the incidental supernova burst). hint to the wave nature of spur system. metre wave radiation. Australian Journal of Physics. remnants. Astronomy & Astrophysics, 24, 143-147. Heiles, C. (1998) Whence the local bubble, gum, orion? bubble. 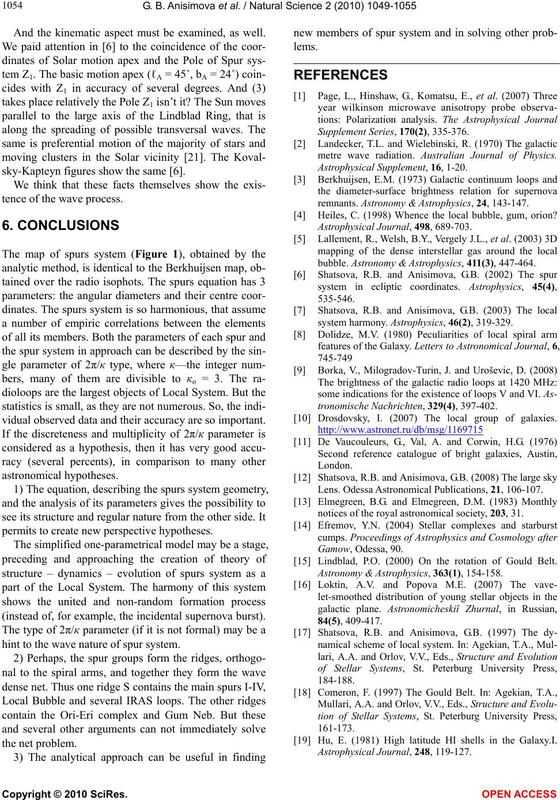 Astronomy & Astrophysics, 411(3), 447-464.
system harmony. Astrophysics, 46(2) , 319-329. Drosdovsky, I. (2007) The local group of galaxies. Lens. Odessa Astronomical Publications, 21, 106-107.
notices of the royal astronomical society, 203, 31. Lindblad, P.O. (2000) On the rotation of Gould Belt. Astronomy & Astrophysics, 363(1), 154-158. 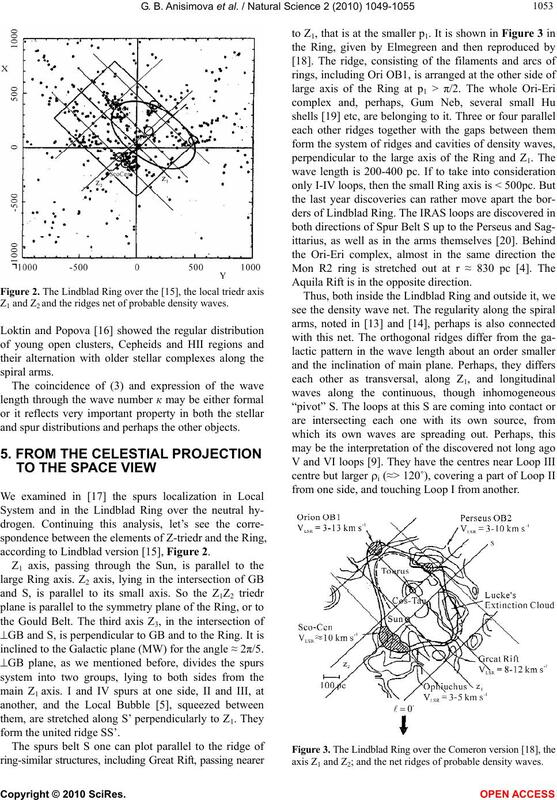 Hu, E. (1981) High latitude HI shells in the Galaxy.I. V.V., Eds., Structure and Evolution of Stellar Systems, St.